The church of St Odoceus lies in a dell reached through the grounds of The Old Rectory. 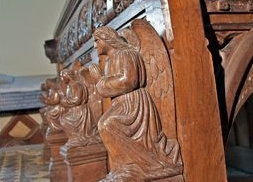 We rescued it in 2006 from a state of dereliction and we have still to tackle the “heave” in the floor of the chancel. The principal contents are the 14th century effigy, supposedly of St Margaret Marlos, a 6th century inscribed stone on a ledge by the chancel arch and the elaborately not to say wildly carved oak altar of 1882 where you should be able to spot lily of the valley, rose of sharon and a passion flower. There is a local group of Friends, to whom we are much indebted. Contact the office to find out more.